What was your highlight of 2013? 2013, you brought us so much that was good, so much that was bad, and so much that we're still trying to figure out (picket-fence building spiders? Why, 2013? Just, why?). With only two days left to go, we want to know what your highlight of the year was. Scientists finally know what created these mysterious structures! Look out over the year as a whole and then tell us what about this year — whether it was on the national, global, or just personal scale —— was the best thing that you did, saw, learned, or that happened. 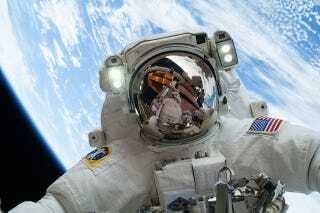 We're particularly fond, for instance, of this selfie snapped by astronaut Mike Hopkins during a NASA highlight, a spacewalk to repair the international space station.